The Pizza School of NY offers the Pizza Masters Course, the most intense pizza training in the world. You will have all the secrets to making our world’s Best Pizzas and recipes . It is completely hands on in every way. We will teach you all we know about pizza and make a master pizza maker out of you. Not only does the class cover all the arts of pizza making, but is specifically tailored to the students’ needs and wants. In other words, we help you develop your own custom pizza menu with all the recipes and standard practices. Our approach is one on one training in a live restaurant environment. It’s all about doing it and getting it right. When our students complete our course they can make any style pizza and know exactly how to train others to do the same thing. Dough Master , Our students learn all the fundamentals of dough making daily. We have comprehensive workbooks that allow our students to grasp the basics and truly learn how to make great products. These fundamental are explained and demonstrated every day. Our students make the dough from our standard recipe from start to finish. The student rolls the dough ,ensures the quality of the dough , and understands all the principles regarding making perfect dough and flour types. This is the basic fundamental of pizza. When the student understands and masters these skills he will never have to worry about perfect dough making again or teaching other the same. The student also gets a training guide on how to make perfect dough every day!  Pizza Toppings How to prepare, store and portion all pizza toppings. You will own it!  Vegetables How to serve fresh and cooked and make your pies look great!  Cheeses we will show you several types and styles and talk about them all .  Portion control and correct topping procedures that will set you up for success.  Pizza styles covered. New York style thin and crispy! 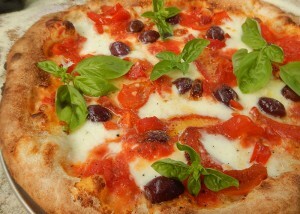 , Old World- Brick Oven, Grandma (thin crispy square), Sicilian The ultimate square Pie. 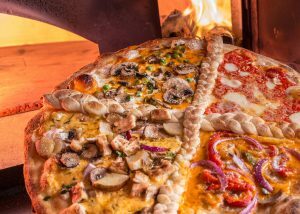 Specialty pies, Dessert pizzas, toppings, salad pizza you name it! 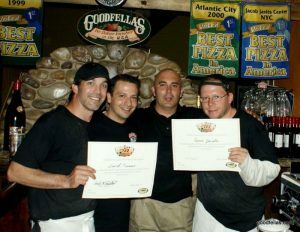 Smoking Goodfellas International pizza champions. World’s best winner international Pizza expo, Tequila Pizza World’s best winner 2012. We have over one dozen super gourmet pizzas that will make your concept nothing but a success.  Wood fired oven skills. Our students also learn how to operate a wood fired oven and practices these skills every day. All the basic fundamentals are explained and the student cooks dozens of pies daily. You must master the oven to master the pizza. Hands on and this is an important part of what you learn daily!  Operational management training and custom pizza menu development. This part of our class deals with,  par sheets This way you will know exactly how much product to have daily  , inventory control You will learn how much and what products to stock  Waste control quality control and training. The quality control checklist is one of the best tools to ensure you always have perfect products every day  The above tools allow an operator to grasp all the fundamentals of the operation side of the pizza station. This gives you a great grounding on what should be done daily from a management aspect of pizza operations.  At course graduation, the student will be a pizza master and be able to train others in his own shop on all the basics. At the class end, you will be able to show case and sell these items with complete confidence. We will also review product specifications and give you a complete list of all products needed for your inventory guide.  Dessert Pizza. Some of the most incredible desserts ever!  Calzones any way you like them. This is a very intense training program our students leave with complete knowledge of how to make the dough, sauce, and incredible pizza. and understand all the basic principles regarding it. We will also be able to answer all your questions about anything we can. We not only teach the art of pizza at our school but we also consult on all jobs from menu development, store design, and equipment specifications. When it comes to learning the art we train all our students in a professional manner and guarantee they will be able to produce perfect pizzas upon completion. The atmosphere is fun hard work and professional. Step by step photos recipes and training materials are all part of what you get and some of the greatest gourmet pizzas ever created to sell in your shop! our pizza station on several busy shifts by the training completion. You will cook live during our dinner rushes as you progress! We also provide chef jackets, hats, and meals. Master Certificate will be awarded at completion. Classes are one on one with master trainers who will work you hard. You are the only student and every question you could have will be answered. We are here to help you succeed. If you are looking for the best pizza consulting look no further there is none. What we offer is peace of mind for our clients. And the ability for them to have a unique concept that offers their guest some of a unique pizza they have ever tasted. For twenty years we have been industry trendsetters. Winning multiple national titles and 3 times international Worlds Pizza Champions and 6 times national. To sum it up we will teach you all we know about pizza and train you daily on all aspects of it. This is not a classroom environment its hands on hard work. You will have workbooks and recipes to follow. If you’re passionate about what you want to learn, are willing to take initiative then you will master the art and this training is for you.